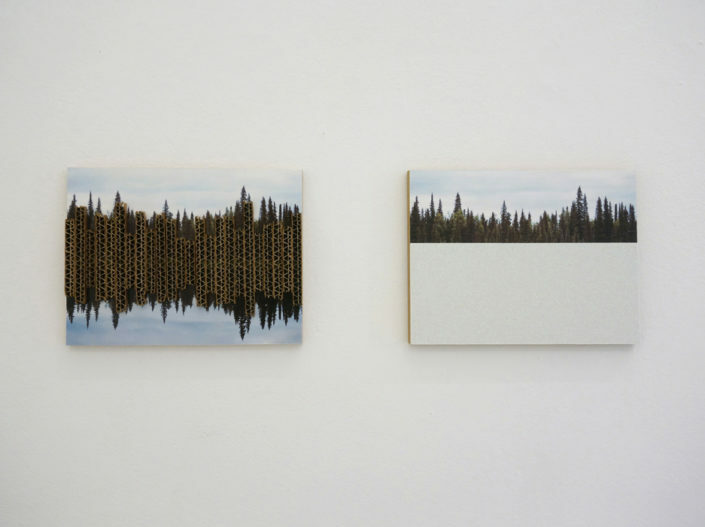 In Surroundings, which works across all of the gallery’s spaces, Horvat approaches the idea of horizon line as spatial limit and border whilst at the same time exploring its powerful and contradictory metaphorical status as aspirational destination. 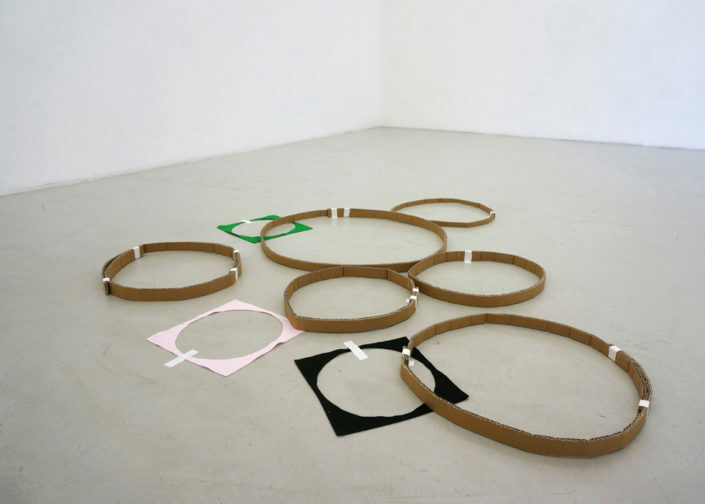 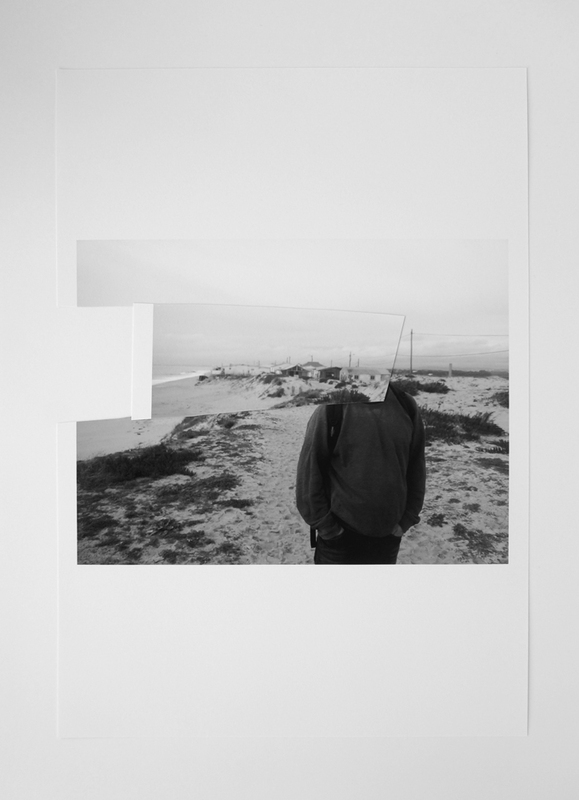 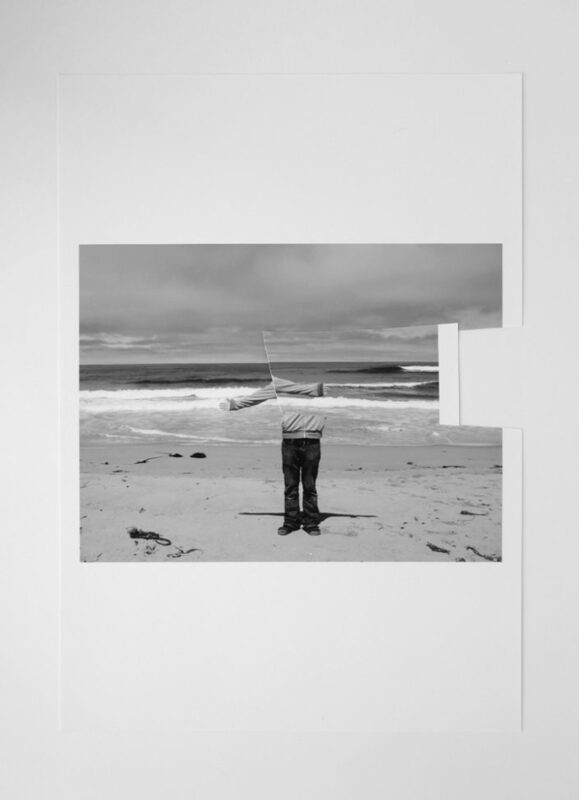 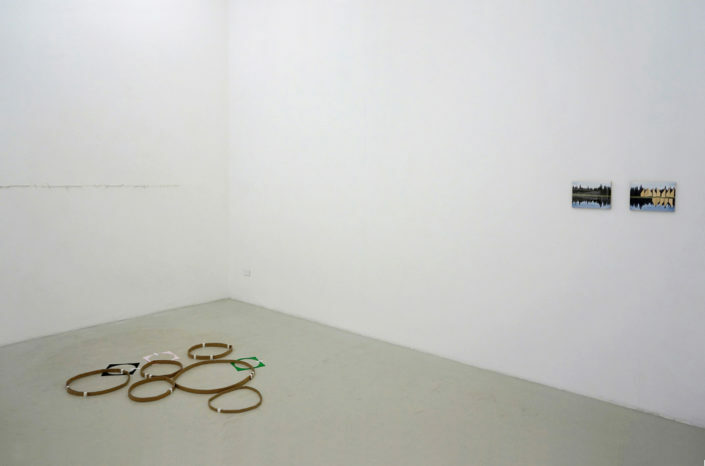 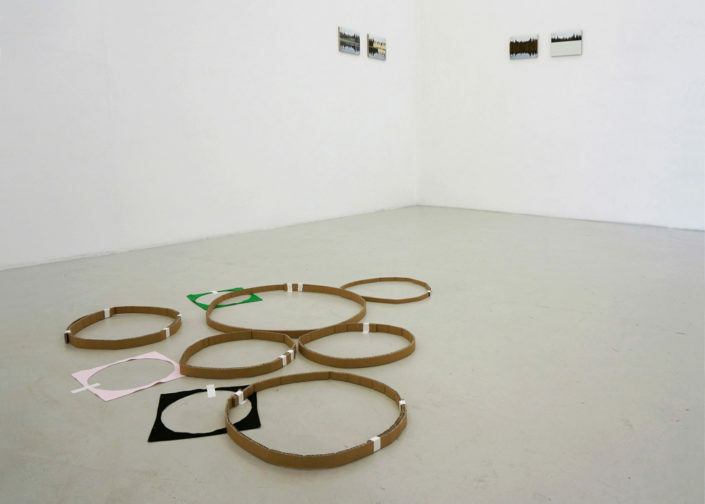 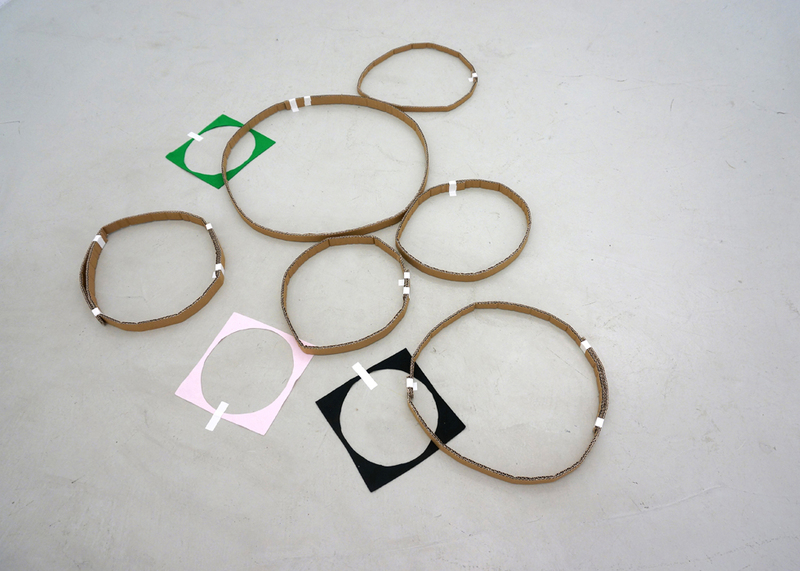 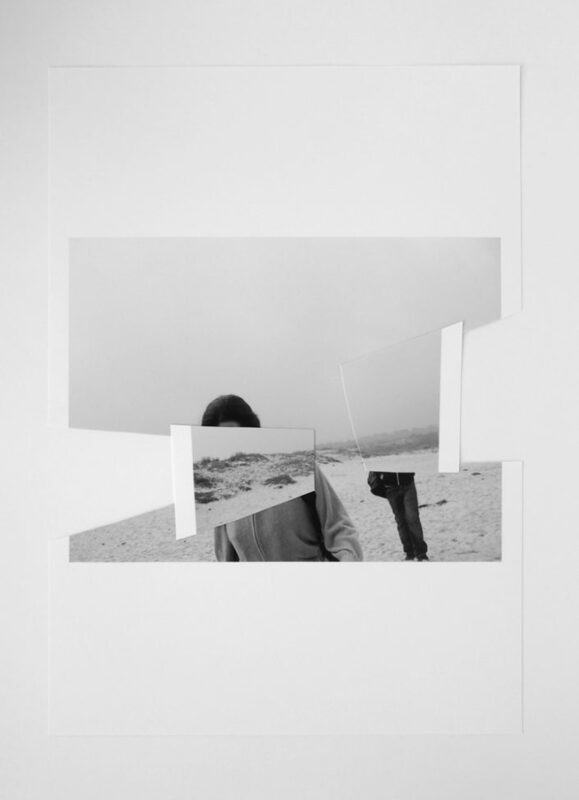 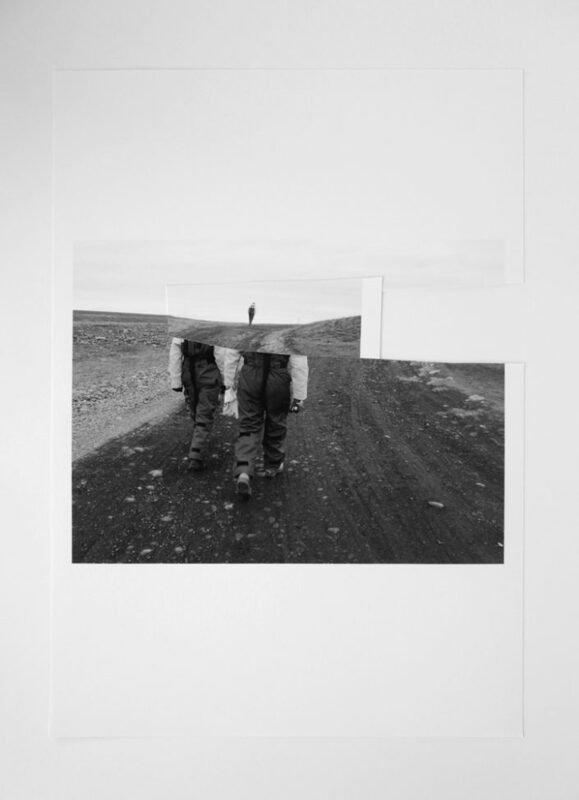 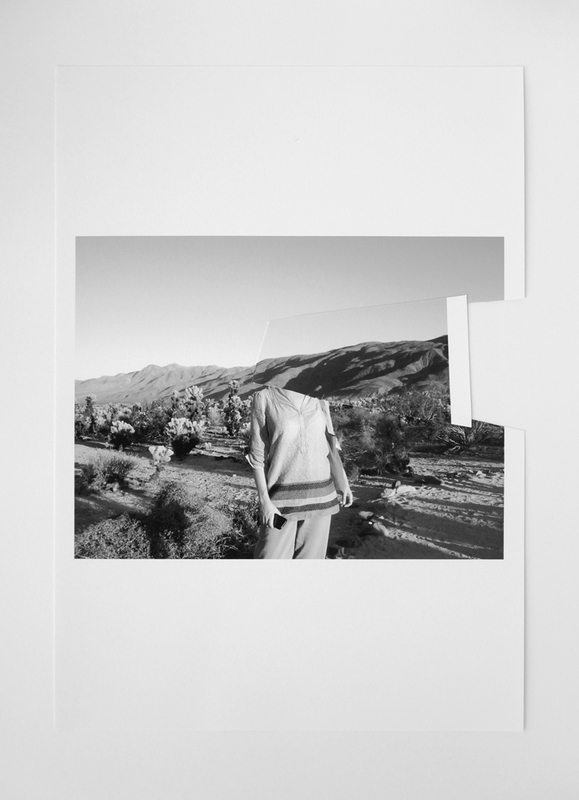 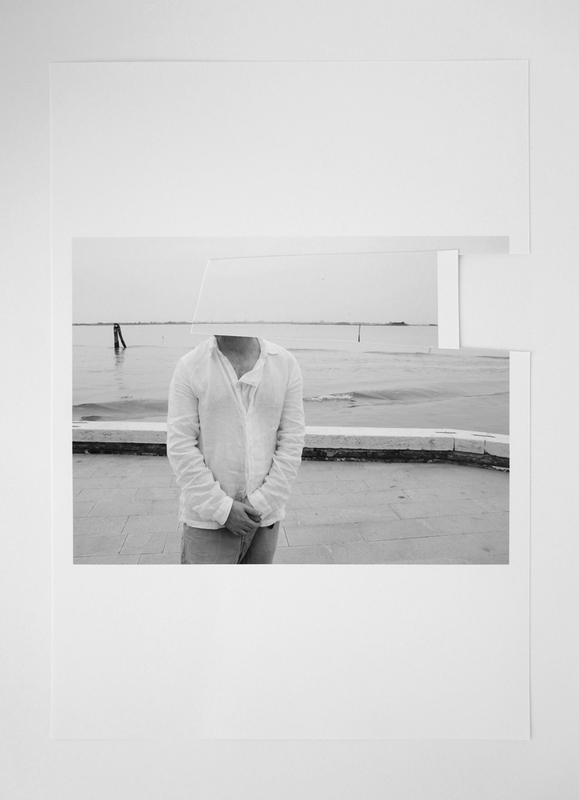 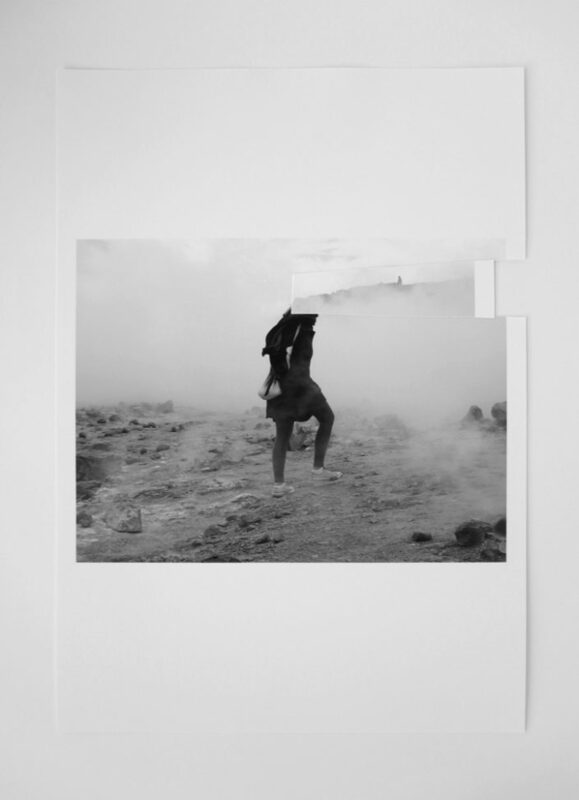 In works manifested in different forms and media – altered photographic image, collage, sculpture, and fragile site-responsive material interventions – she renders the horizon as an edge of space and visibility, and as a sign or site of future potential and action. 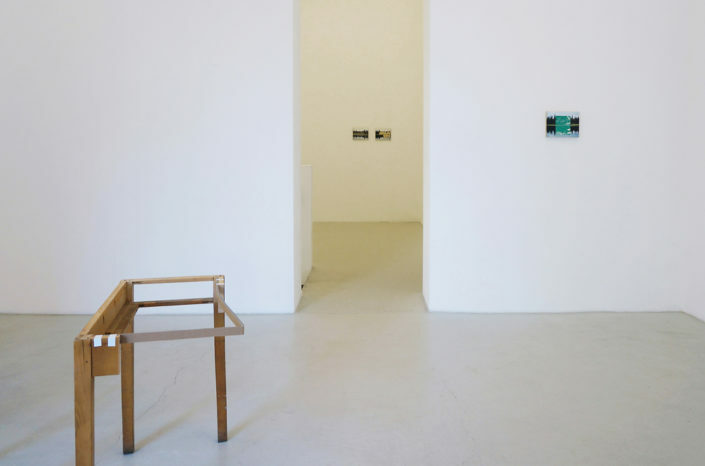 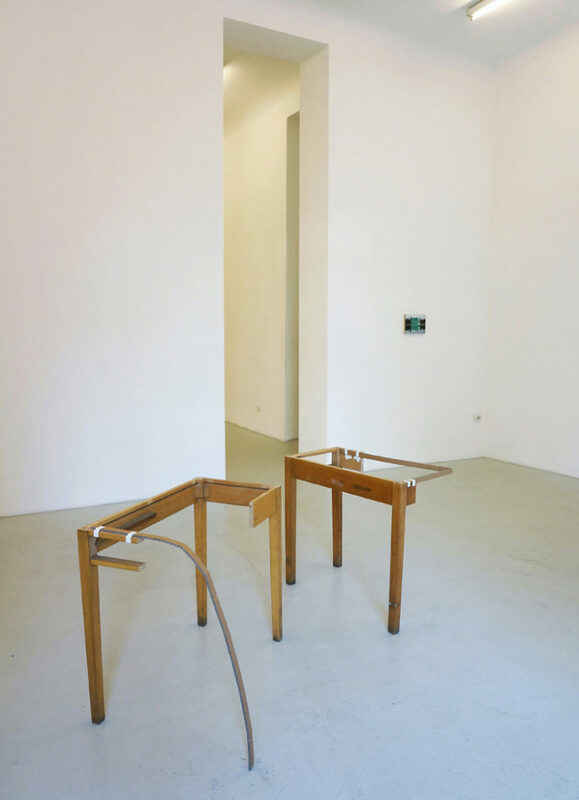 A similar contradiction lies at the heart of At Some Length, a fragile sculptural intervention which Horvat uses to connect the front and back spaces of the upstairs gallery. 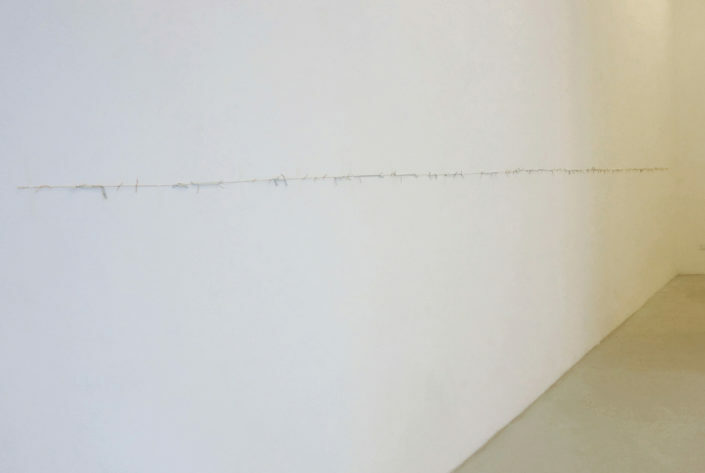 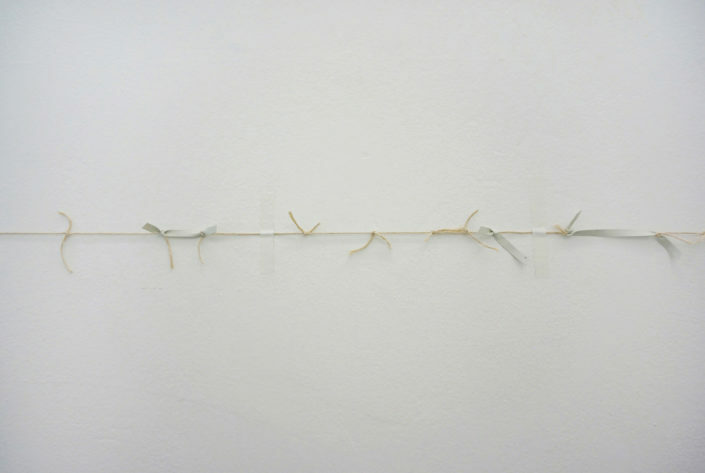 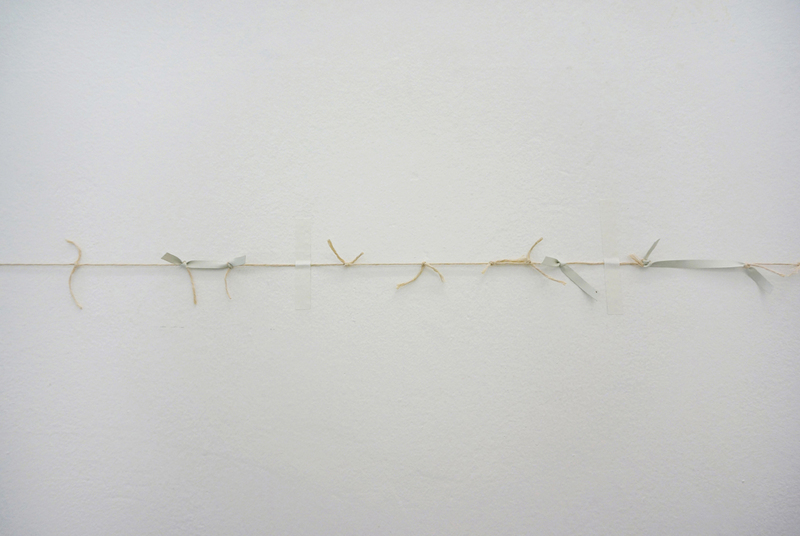 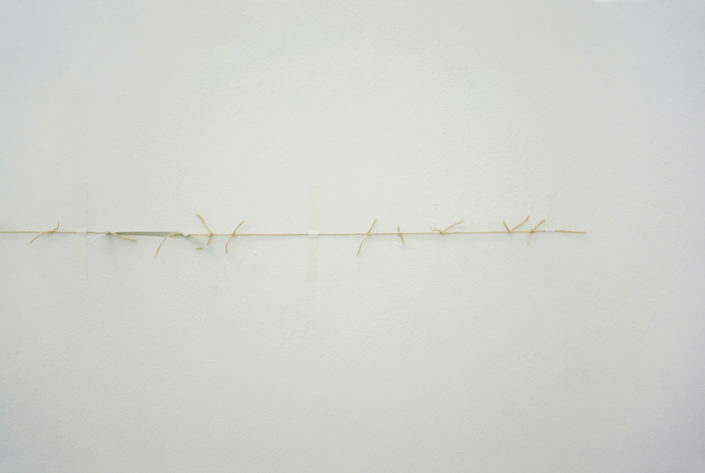 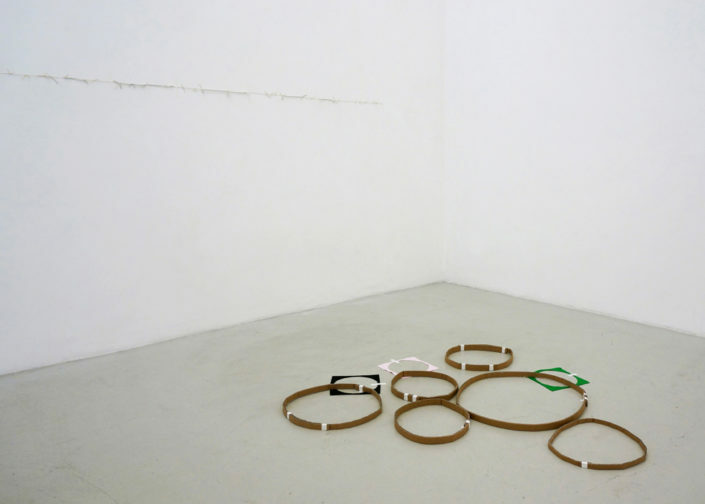 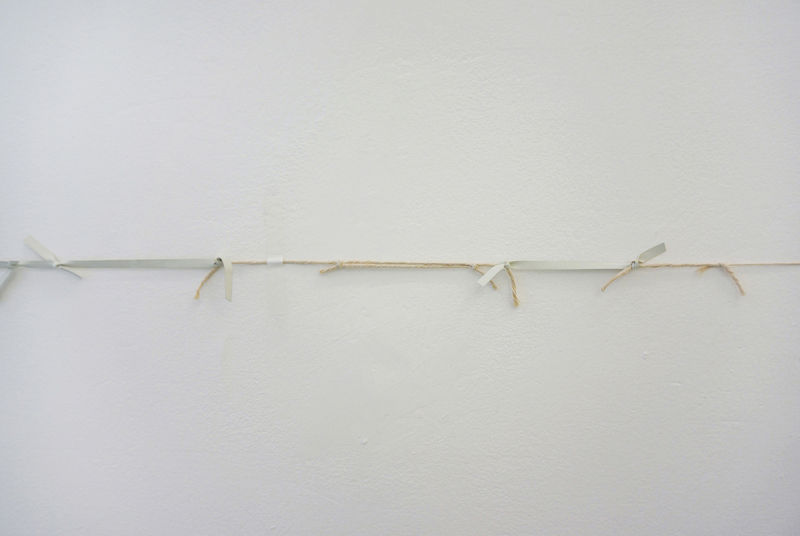 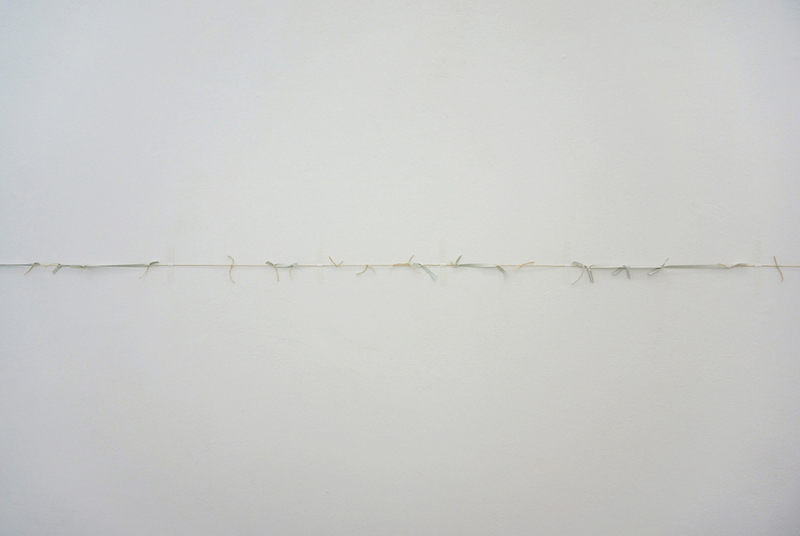 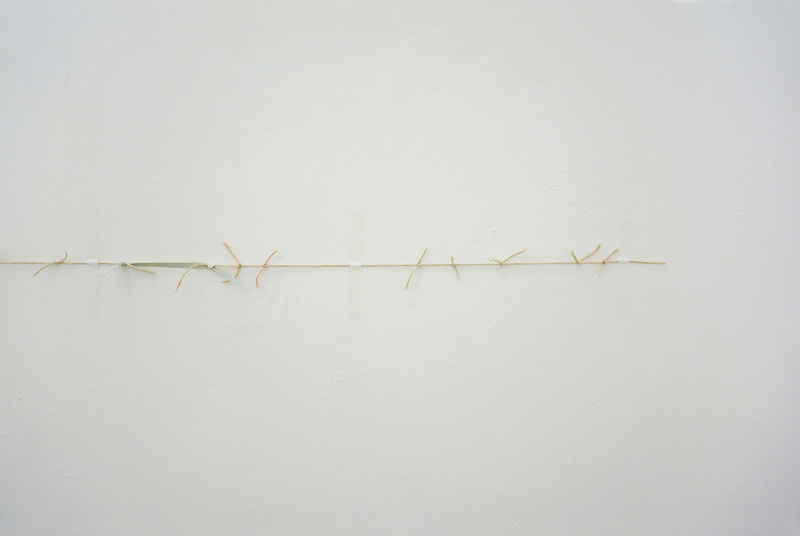 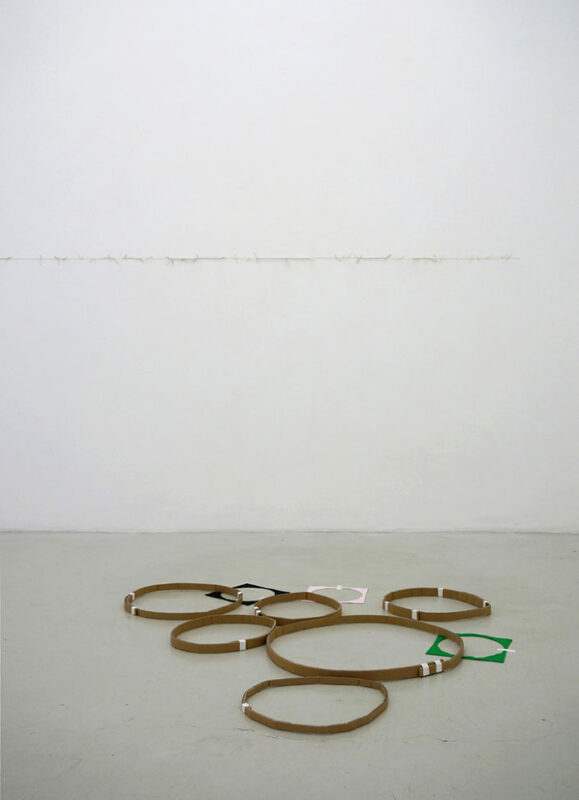 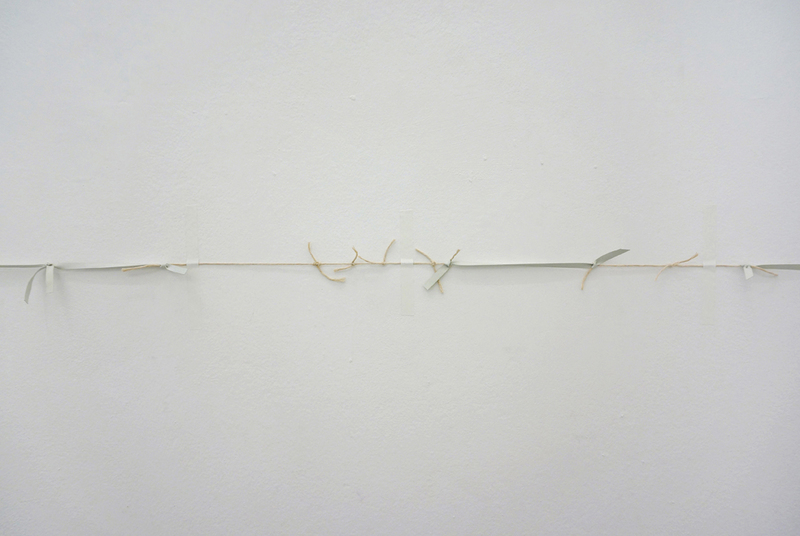 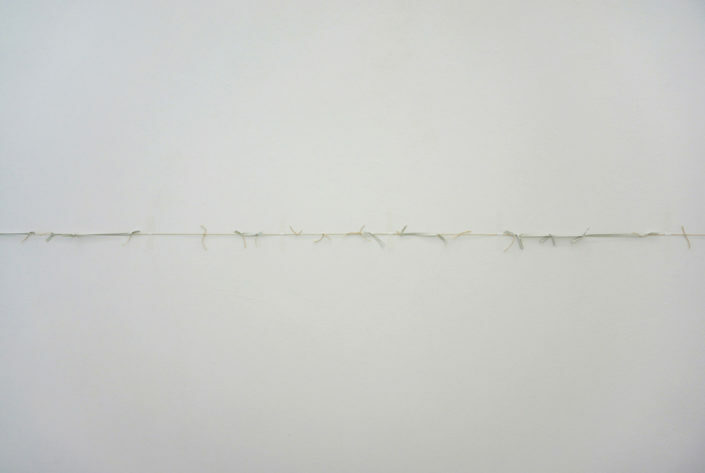 Made from scraps of string and elastic crudely knotted together to form a single line, the work follows the path of the existing walls of the room, a frail marking of – and on – an already existing solid spatial barrier. 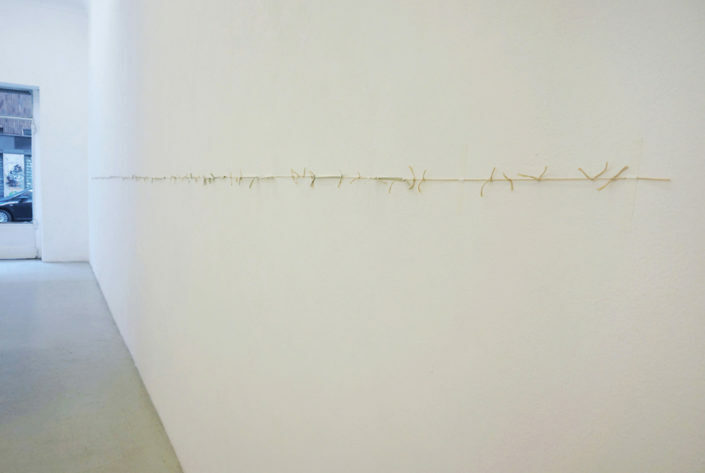 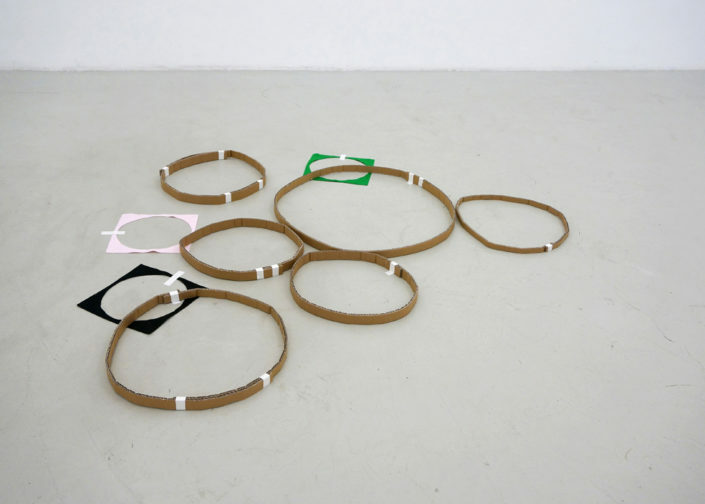 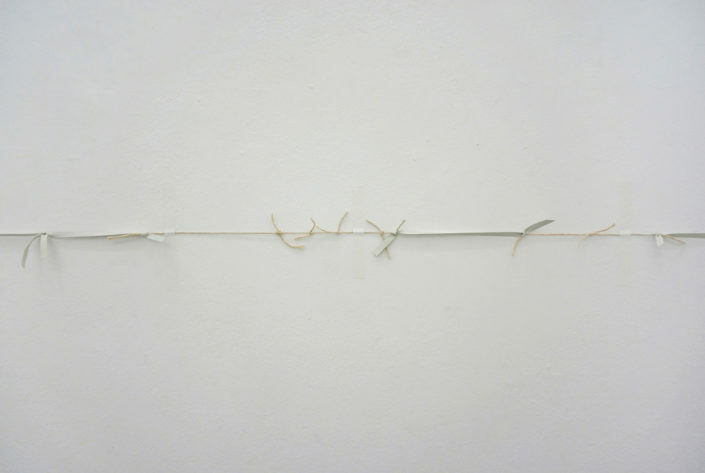 Ambiguous in purpose and intention, Horvat’s intervention is at the same time an improvised measure of the space and a rudimentary territorial marking or fence reminiscent of barbed wire – however materially inadequate for that purpose. 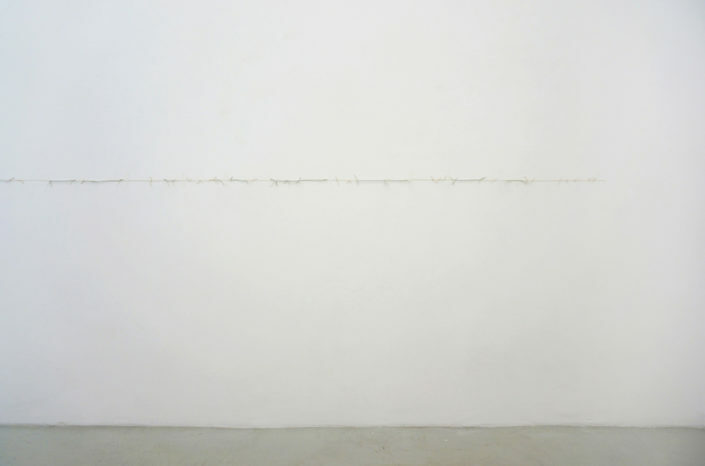 It is also a simple dividing line, separating the room into what lies above and below this temporary division – a crude landscape drawing conjuring spatial expanse and distance on the walls of the gallery. 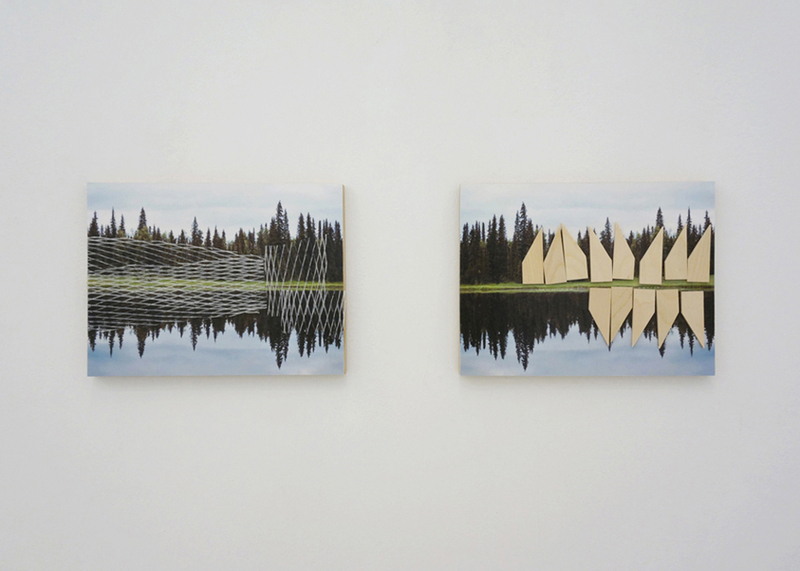 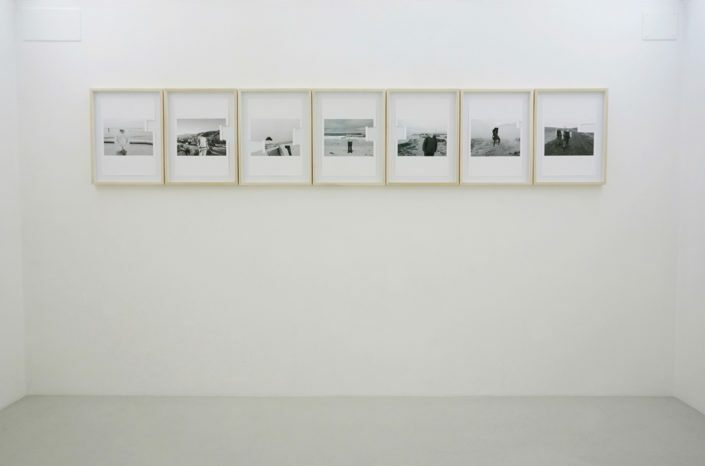 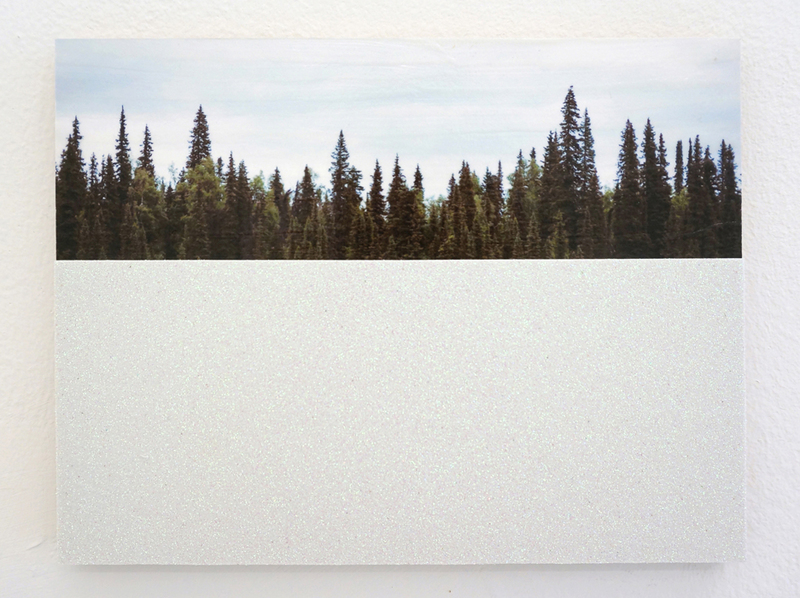 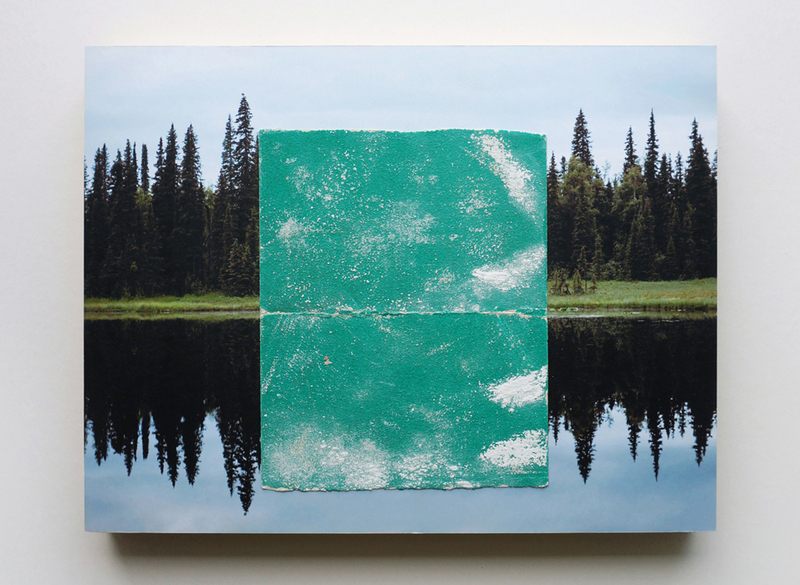 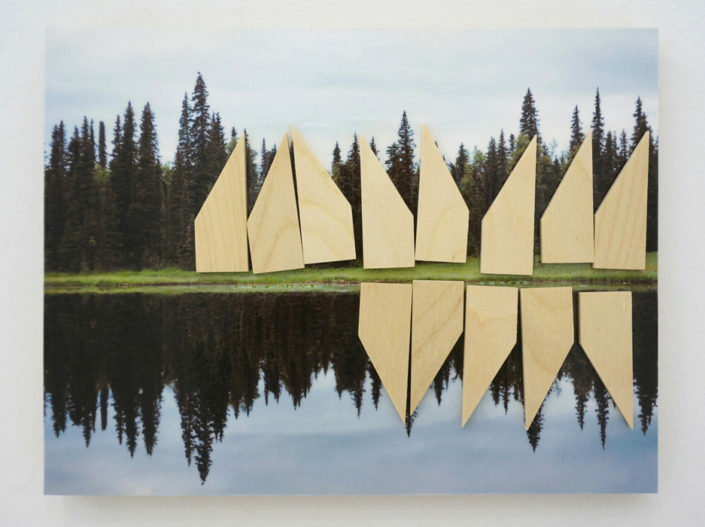 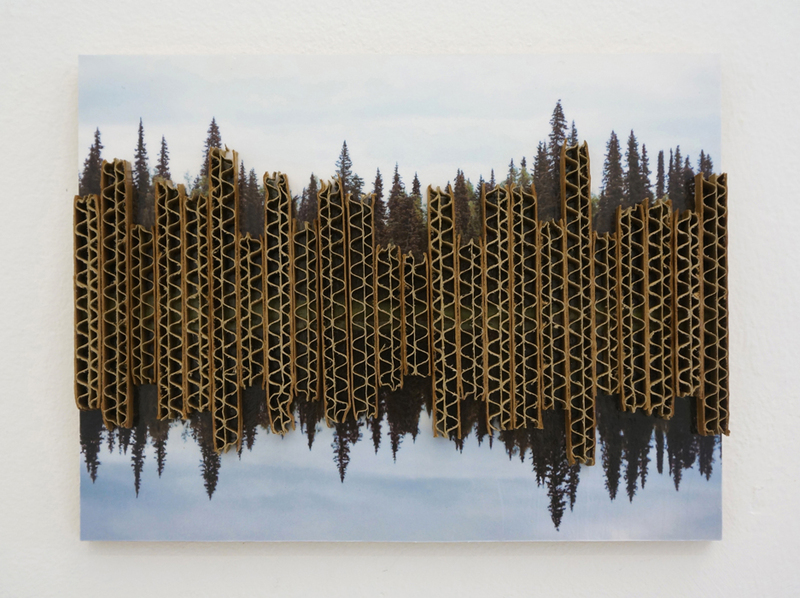 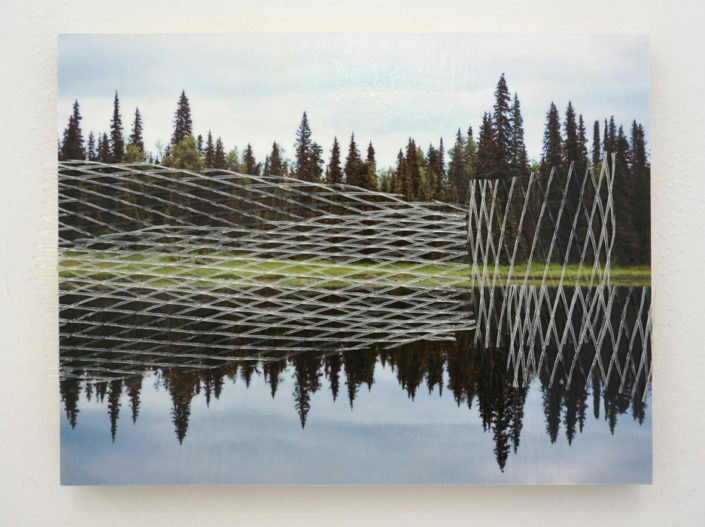 In the other collage works in the show – grouped under the name Tree Line – Horvat intervenes repeatedly on an image depicting trees at a waterline of a lake, their forms reflected perfectly in water below. This uncanny already doubled horizon line is subjected to a series of diverse interventions which at times emphasize and at other times obscure or render illegible the strip of the horizon. 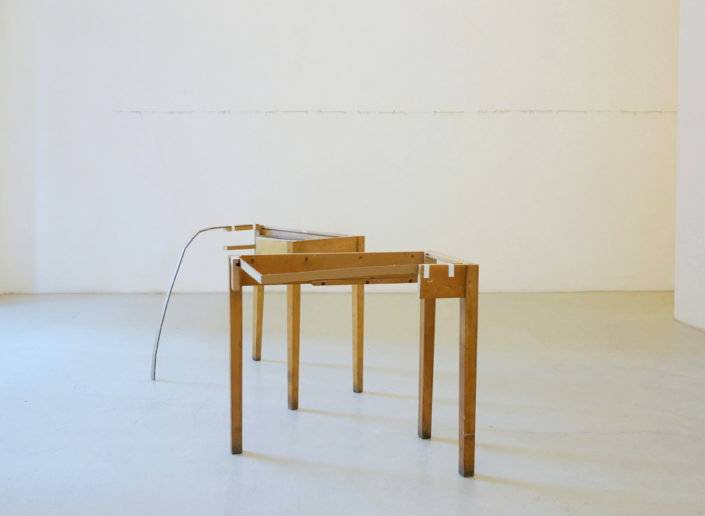 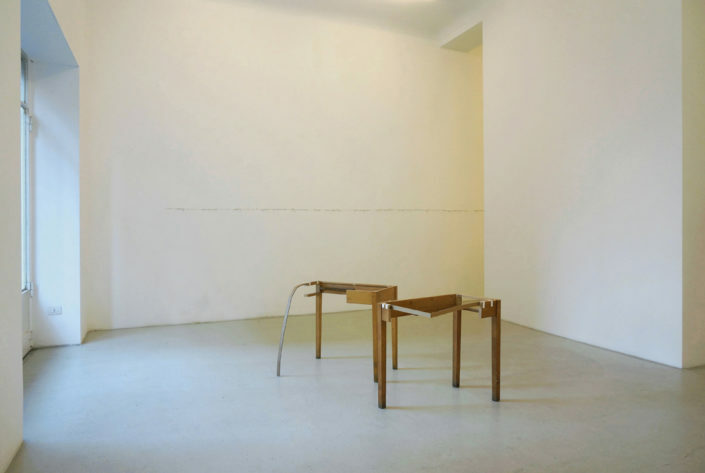 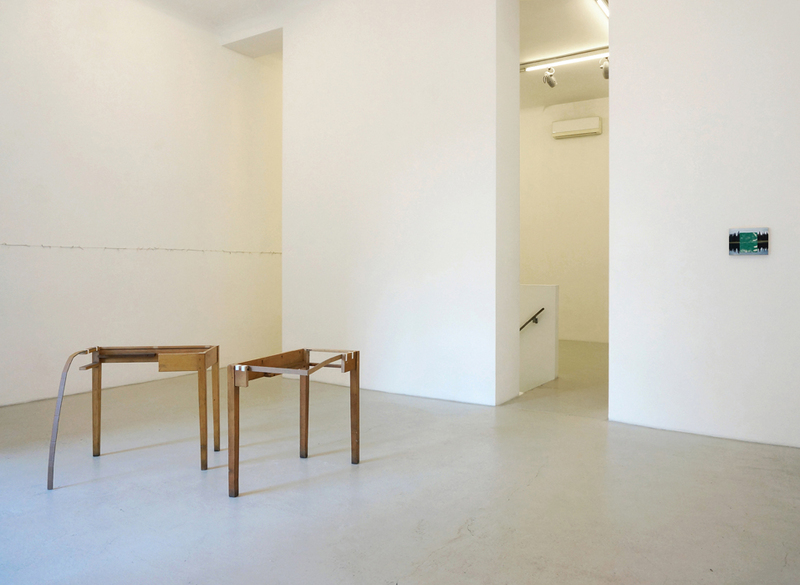 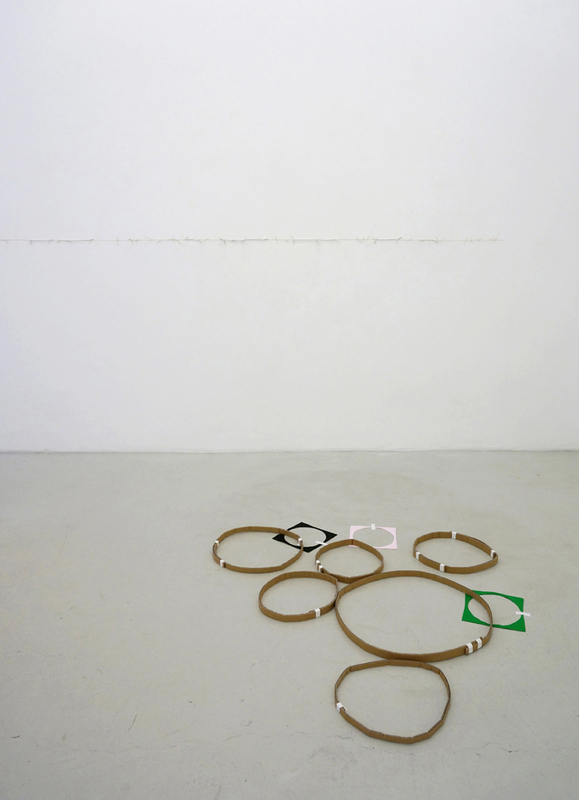 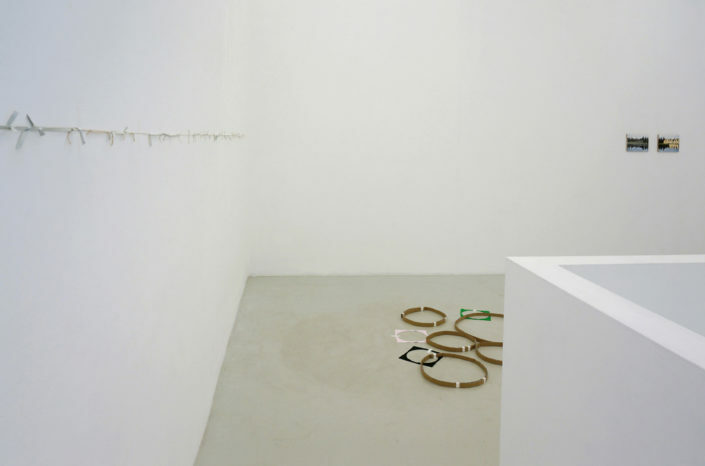 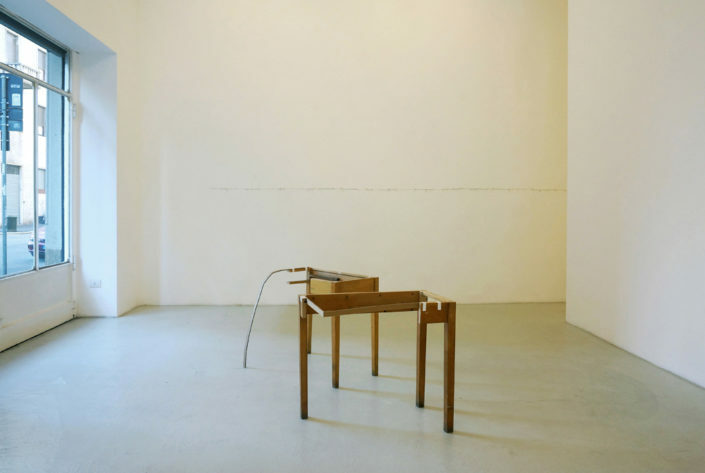 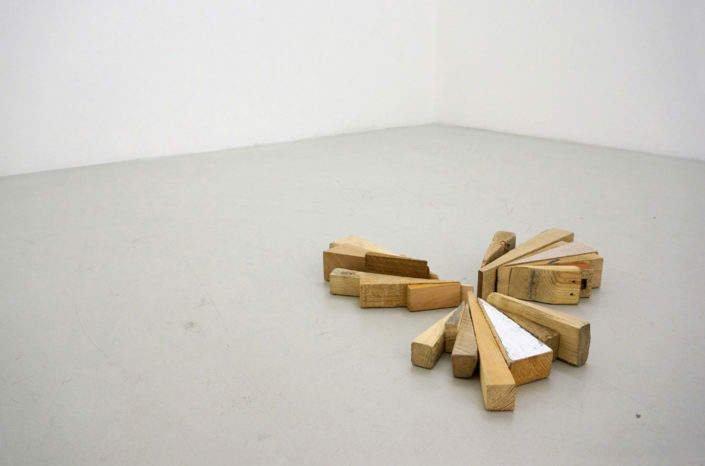 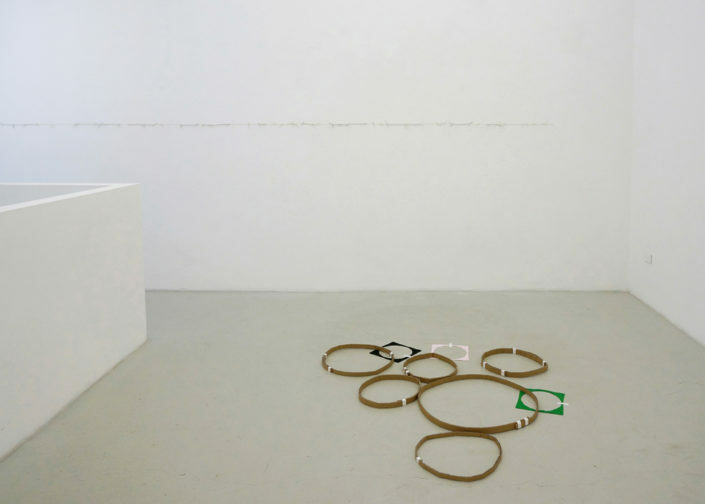 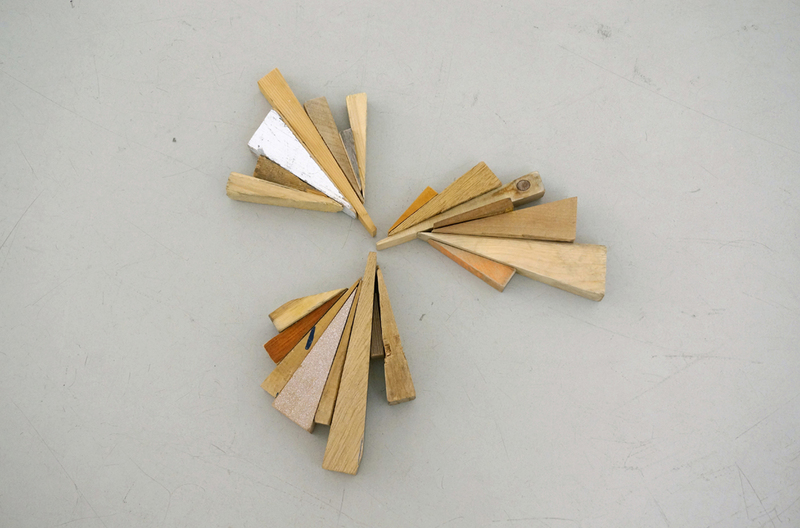 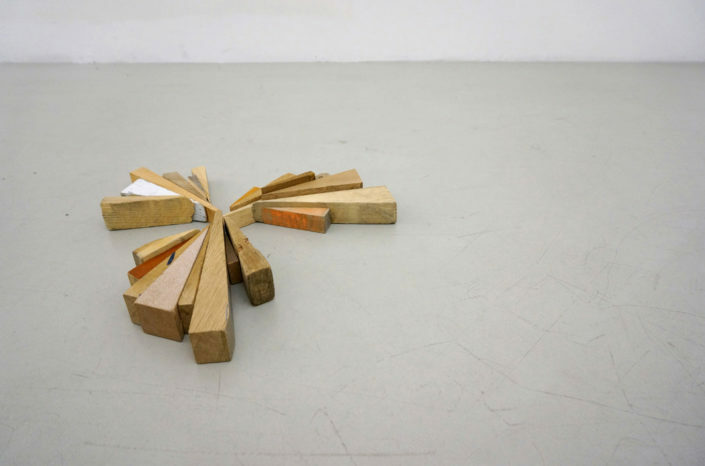 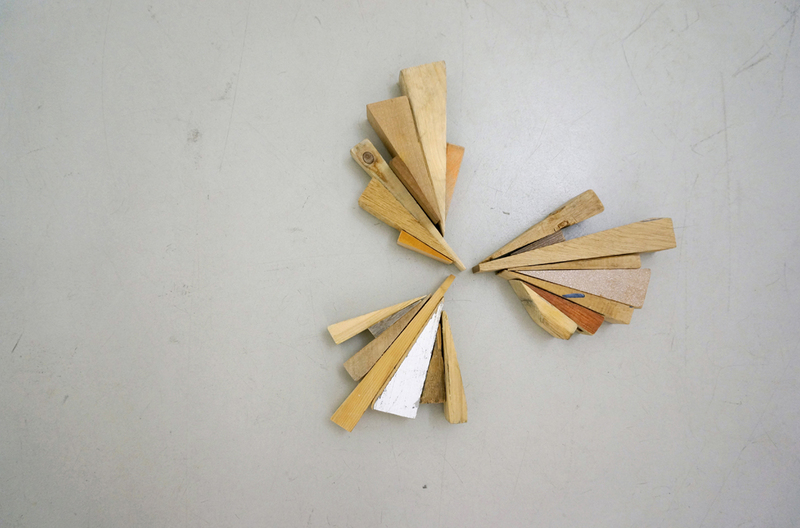 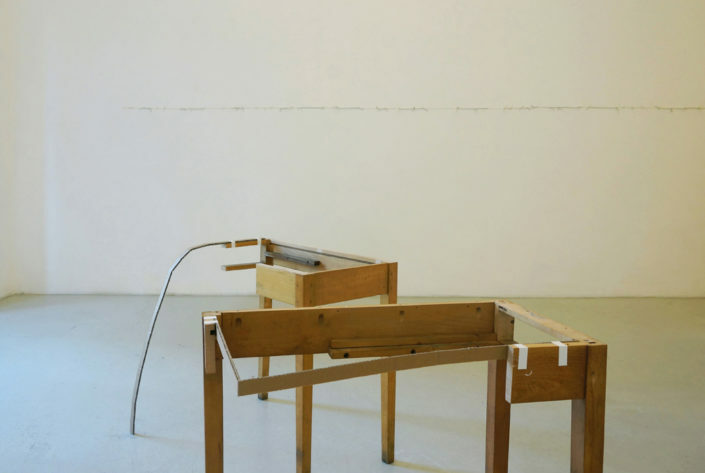 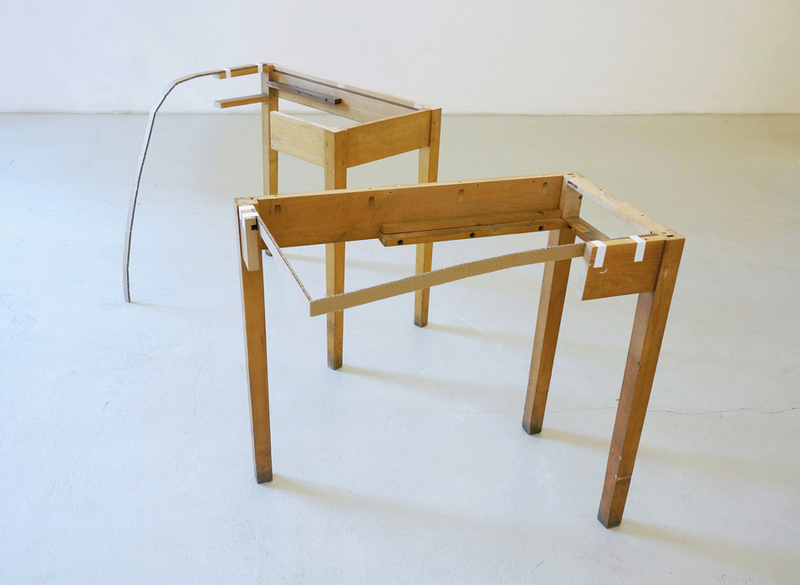 The procedure of using the line as a both a means of connecting and of separating is used again in the set of two sculptural works titled Set Right in which Horvat first cuts up wooden tables, removing certain parts from them – the table top in one instance and a leg in another – and then performs the gesture of “repairing” the missing parts of these objects with cardboard strips – once again using a temporary material, decidedly inadequate for the job. 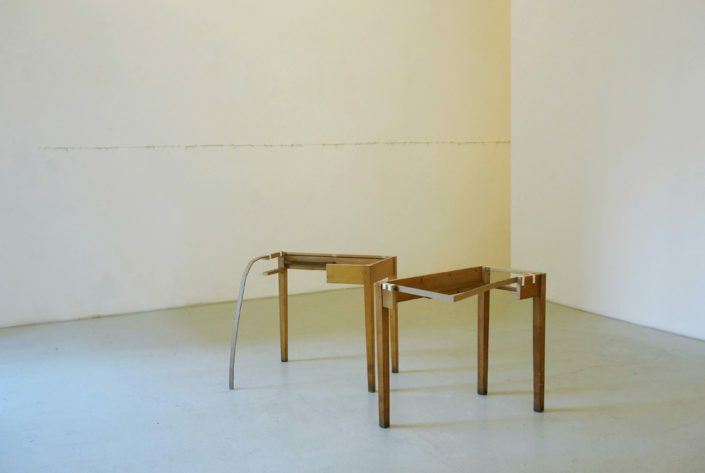 In this process the tables are altered from functional everyday objects into non-utilitarian ones. 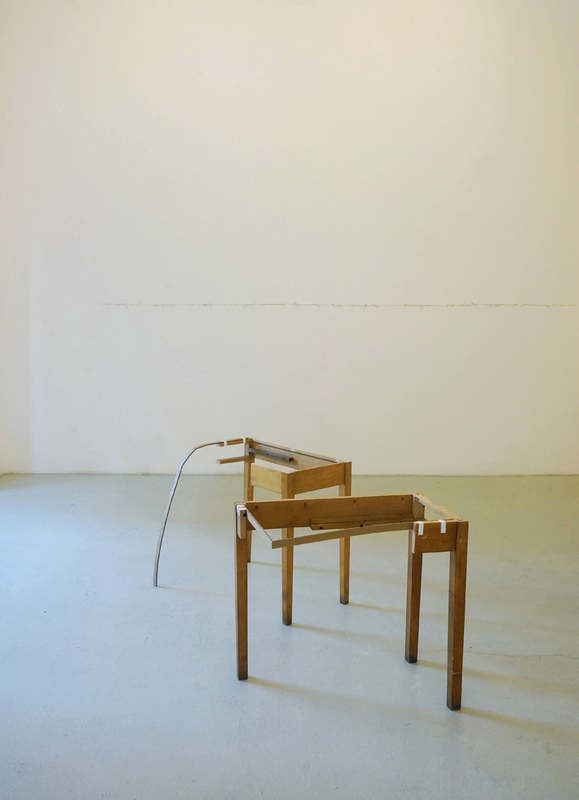 The line used to “repair” or complete them creates here a field of action that is simultaneously material and imaginary, as the lines extend, re-frame and re-imagine the tables as hollow 3-dimensional line drawings in space, marking out the boundaries of newly created enterable spaces.